India: Linked or De-linked From the Global Economy? With economic growth expected to continue at a reasonably good clip this year and next, it’s all too easy to think there’s not much to worry about. Even as Diwali celebrations begin across India, the outlook for the world economy is fairly uneven and uncertain. More worrisome than the subdued global growth outlook, risks are building up especially in Europe—and these include an extreme scenario with financial disruption. Although India’s economy has generally been less prone to external forces than many others, we still need to contend with the larger than typical risks in the global economy. These risks harken the need for a new wave of reforms. What does the more somber darker global outlook mean for India? And exactly what policies are needed? In our latest Regional Economic Outlook for Asia, we expect India to grow by about 7½ percent in 2011 and 2012, only marginally below its estimated potential. Even within Asia, India does relatively well in this world. India is less open to international trade than most other economies in the region. In particular, its rural consumption is fairly insulated from the world economy. More importantly, India’s exports are less dependent on advanced economies, so it suffers less from the current anemic outlook in those countries. 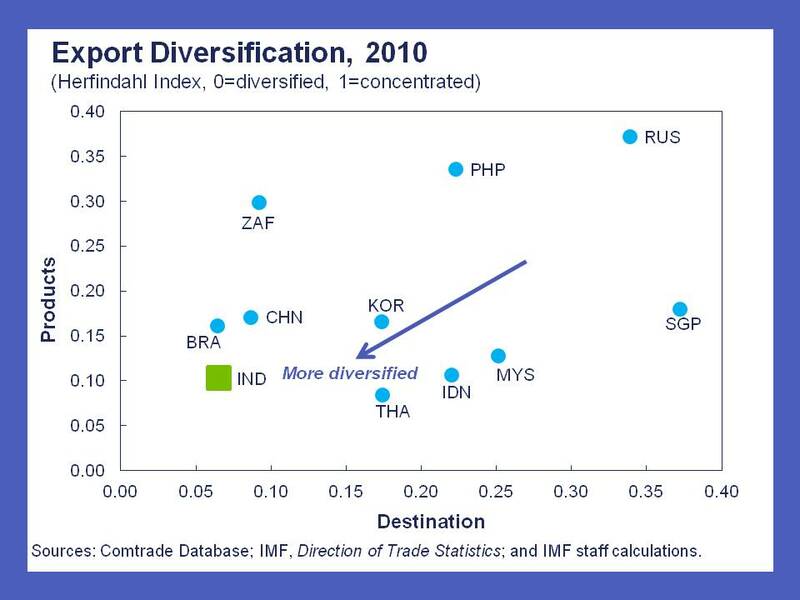 The chart below shows that India’s exports are more diversified—both geographically and in terms of the products it sells—than its neighbors and competitors. So, while a more protracted slowdown in the advanced economies will also lower India’s growth somewhat, we expect that it will still remain robust. In this scenario, India has to remain focused on the challenge of elevated inflation. But what happens to India in an extreme scenario with the contagion of further financial shocks, similar to what happened after Lehman? India has become more financially integrated with the global markets than commonly thought. We saw this in 2008, when India’s financial markets came under considerable pressure and investment became the main transmission channel, dipping substantially. 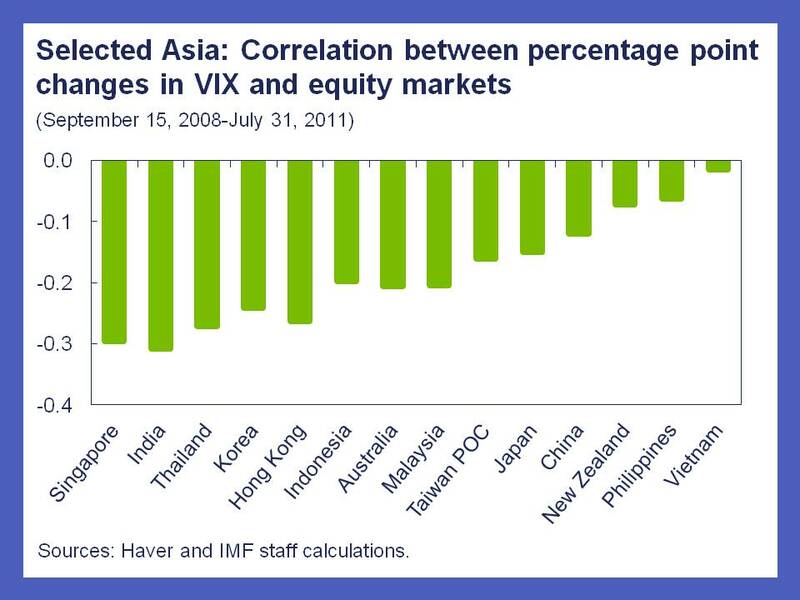 To give another example, India’s stock market is one of the most correlated in the region with the VIX, a measure of market expectations of near-term stock market volatility and hence a good indicator of global risk aversion. In such a scenario with more extensive financial shocks, we expect that India would also be hit as it has a current account deficit, some of its main corporates are global players that now rely more extensively on external debt issuance, and foreign investors now also have more extensive holdings in the Indian stock market. At the same time, India has the tools and the experience to deal with a repeat of 2008. But, like other emerging market countries, they likely have less policy space now, with much of it having been used as a buffer when the crisis first hit, and inflation remaining above the Reserve Bank of India’s comfort zone. While dealing with the present challenge of reigning in inflation, the need remains to rebuild the buffers to re-create policy space. In this regard, fiscal consolidation remains pivotal. Implementation of the official plans to shift the composition of budgetary expenditures away from untargeted subsidies (such as those on fuel and fertilizer) and toward infrastructure, health, and education will help in both dimensions. The strength of domestic demand was, in large part, India’s saving grace when the crisis hit. And, today, domestic growth drivers still need to compensate for the external headwinds. In 1991, India’s government undertook critical reforms, prompted by a balance of payments and fiscal crisis. And these reforms have continued paying off to this day. The planned budget expenditure reforms should certainly help domestic demand to be the backbone of India’s ability to withstand external pressures. Also, a new wave of structural reforms can help boost investment: from introducing the GST to improving the business environment, to liberalizing the labor market, and furthering trade and financial reforms. Indeed, today’s risks can be translated into tomorrow’s reforms and growth momentum. This post originally appeared at iMFdirect and is reproduced with permission.